Vincent van Gogh tried his hand at becoming an art dealer towards the end of his life, but failed dismally. A new book on the Van Gogh Museum’s collection of Japanese prints argues that the artist bought over 600 examples in early 1887 with a view to selling them and becoming financially independent from his brother Theo. Although he exhibited the prints in the Parisian bar run by his Italian girlfriend Agostina Segatori, the venture proved a financial disaster. As Axel Rüger, the director of the Van Gogh Museum, explains, the prevailing image of the artist as an enthusiastic collector of Japanese prints needs to be revised: he bought “not for pleasure but to deal in them”. 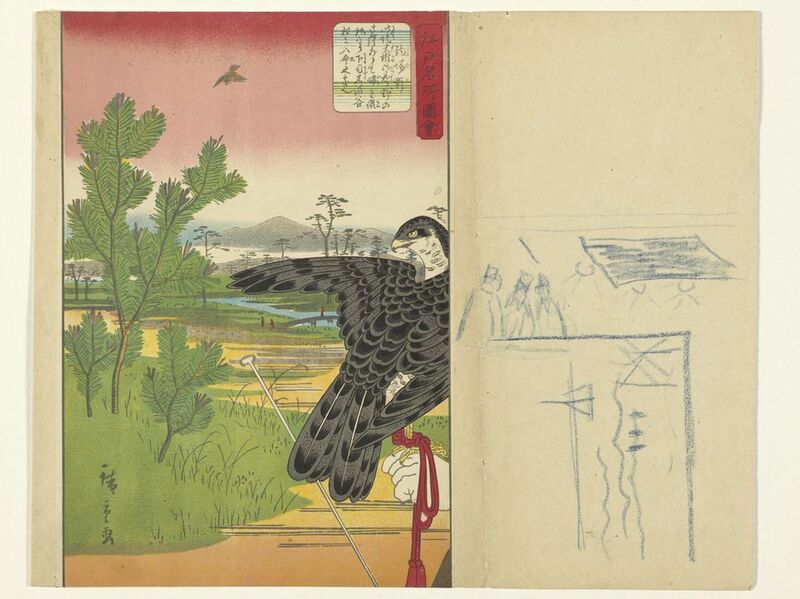 In the book Japanese Prints, the authors provide a detailed account of Van Gogh’s collection. He bought the highly coloured woodblock prints from the Paris-based dealer Siegfried Bing, who popularised Japanese art and went on to invent the term Art Nouveau. Van Gogh initially made a downpayment of 10 francs towards the agreed price of 100 francs, with Bing receiving the balance later. The price of each print was 15 centimes, the equivalent of an aperitif in a bar, and the artist hoped to sell them for 25 centimes. New research has established what happened to Van Gogh’s 660 prints. He gave a few to his artist friend Emile Bernard, a couple of which turned up at a Drouot auction in Paris last December. Van Gogh gave a large group to his sister Willemien (Wil). Of these, 27 are now widely dispersed in the Van Gogh family. For researching the book, the family gathered for a unique occasion, each member bringing their print to be studied and photographed and then properly framed at the museum. Twenty other prints went to the family of Dr Paul Gachet, who cared for the artist after he shot himself. But the bulk of Vincent’s collection passed to Theo and is now at the Van Gogh Museum. Altogether 511 Japanese prints are at the Van Gogh Museum, 14 at the le Musée national des arts asiatiques –Guimet, 2 at the Musée du Louvre, 2 at the Rijksmuseum, 1 at the Courtauld Gallery (another was stolen in 1981) and 27 remain with members of the Van Gogh family. Around 150 have disappeared. Of the surviving prints, about a quarter have pinholes in the corners, indicating that they were hung in Segatori’s bar or in the artist’s studio. Van Gogh had originally bought the colourful woodblock prints to sell, but he proved to be no salesman. However, Japanese prints ended up becoming a source of great inspiration. He began to crop images in his paintings, as the Japanese did, and he was greatly inspired by their love of spring blossom. Prints such as Utagawa Hiroshige’s The Outskirts of Koshigaya in Musashi Province (1858) led to his painting of Almond Blossom, done five months before his death in 1890. • Chris Uhlenbeck, Louis van Tilborgh and Shigeru Oikawa, Japanese Prints: The Collection of Vincent van Gogh, Van Gogh Museum, Amsterdam and Thames & Hudson, London. The exhibition Van Gogh & Japan runs at the Van Gogh Museum until 24 June.